Wine Country – Members of South Central Kansas Tourism Region enjoy the environment of the Rosewood Winery and Rosewood Ranch. Pictured are Joni Regnier, McPherson CVB director and Cynthia Mines with Travel Kansas Magazine. The winery, located at 1171 SW 20 Road in Pawnee Rock, is the only one in the nation devoted to providing employment opportunities to people with developmental disabilities. Rosewood Winery is open Thursday and Friday 1-5pm and by appointment by calling (620) 982-4487. “Kansas has more to offer than you think.” That’s the mantra of the South Central Kansas Tourism Region. On Wednesday, Nov. 28, members of the organization put that slogan to the test by venturing onto country roads to discover one of those tucked-away destinations that is nestled in the rolling plains west of Great Bend. 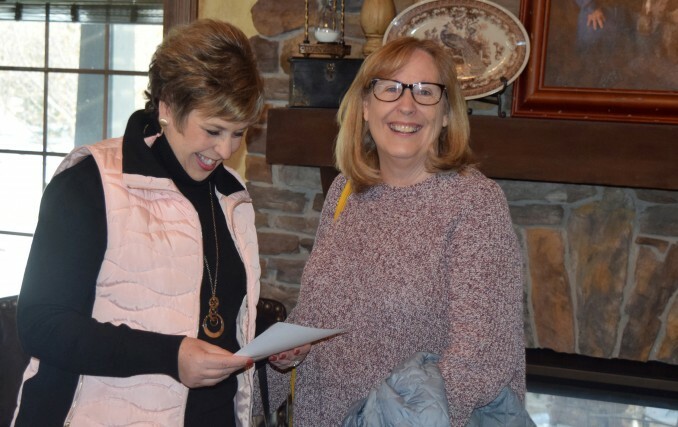 Members conducted their November meeting at Rosewood Winery, which is part of Rosewood Ranch, located five miles north of Pawnee Rock. Although there are more than two-dozen wineries in Kanas, Rosewood Winery is the only one in the nation devoted to providing employment opportunities to people with developmental disabilities. It opened in the fall of 2012 and has provided work opportunities for people with disabilities ever since, producing more than 30 varieties of Kansas wines at that location. SCKTR is an organization whose members are associated with industries of attractions and events. Members represent 22 Kansas counties that are dedicated to enhancing tourism exposure in the south central Kansas region. Barton County represents the northwest area for that region. For Wednesday’s meeting, the SCKTR members were hosted by Great Bend community coordinator Christina Hayes, who also heads the Great Bend Visitors and Convention Bureau. Great Bend community member Mark Mingenback gave a special presentation to the group titled "Importance of Community Self Image." In that presentation, he stressed the importance of building positive relationships. During the meeting, each tourism representative shared upcoming holiday events and activities happening in their locations and across the state of Kansas. Following their meeting, the group had lunch and toured the winery, as well as Rosewood’s equine therapy ranch. They also had the opportunity to participate in wine tasting. For more information, contact Jennifer Stoddard, jennifers@rosewoodservices.com, 620-617-7913.